Photography is a powerful medium that can capture a scene and provide emotional resonance that words cannot capture. Excellent photojournalism requires research, planning and a keen eye for distinguishing the shots that best capture a moment. When the Pope visited the United States in 2015, Tobias Hutzler, renowned for his wide-angle, long-lens photography took a unique approach. His photos, shot from distinctive perspectives, captured an aura surrounding the Pope. 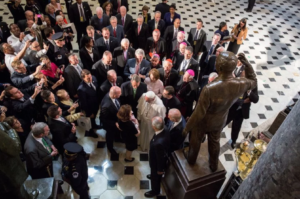 With massive amount of media coverage, Hutzler’s photos stand out because his images focus on the Pope’s impact. Wide-angle shots display the massive amount of security, press and crowds gathering throughout his six-day trip in the United States. One photo that is particularly striking shows a woman, unexpectedly presenting the Pope with her baby. This image is incredibly moving because it captures not only the moment, but the power of belief. This photo is a credit to Hutzler’s attention to preparation and adaptability. This entry was posted on Tuesday, November 15th, 2016 at 11:37 am and is filed under PHOTOJOURNALISM. You can follow any responses to this entry through the RSS 2.0 feed. Both comments and pings are currently closed.